Outspoken analyst Michael Pachter thinks that there's no way EA will top its rival's COD juggernaut. Call of Duty is very, very popular. Unfortunately for EA, COD is the property of its chief rival, Activision - and EA has been throwing everything including the proverbial kitchen sink to try to dislodge Call of Duty as the shooter king of the hill. Medal of Honor failed to do that, and EA's next salvo is CryTek's Crysis 2, which hits shelves this week. If Crysis 2 doesn't dethrone Call of Duty, EA's third attempt will be DICE's Battlefield 3 - and DICE's Karl-Magnus Troedsson made it abundantly clear that the studio was setting its sights on its competition. Unfortunately, when asked whether COD or Battlefield would come out on top, ubiquitous games analyst Michael Pachter looked into his crystal ball and determined that Battlefield 3 doesn't have a prayer of unseating Call of Duty. 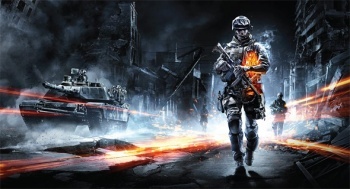 "There is no prayer that Battlefield 3 will top the next Call of Duty, silly question," Pachter said in his IndustryGamers column. "EA is trying to gain share incrementally, and I'm sure that if it is a great game, Battlefield 3 will sell 25 - 35% more copies than the last version. It would have to sell around 300% more than the last version to topple Call of Duty." "The question you didn't ask is whether Battlefield 3 will take share," clarified Pachter. "[Based] upon the growing installed base of COD multiplayer players, it's possible that BOTH games will see higher sales in 2011, so I wonder whether EA will actually 'take' share." In other words, Battlefield 3 might sell more copies than the last one, but so will Call of Duty - so DICE and EA might not be closing the gap at all.